Terrible mistake picking a running back #2 overall. We just saw Gurley turn into a pumpkin when it mattered most. Gurley is in his fourth year and it already looks like the Rams are planning to reduce his role into that of a part-time back. Is he going to continue getting 300+ touches a year? In his four game post-season career, Gurley averages 12 touches per game which is closer to Darren Sproles than Adrian Peterson. That kind of contribution isn't worth a top-10 pick and certainly isn't worth the money Gurley is being paid. How many years before Barkley is reduced to a part-time role? Clock is ticking. If they don't win now, it may be too late in a few years. Be kind to morons. Don't feed the trolls. Those wanting this topic to go away might want to come to the realization it's only getting started. They want the topic to go away because they have doubts about the Barkley pick. Even the biggest homers and Barkley cheerleaders aren't authentic believers in the Giants strategy. And you're right. The topic won't be going away any time soon. and no one knows when that will happen. one year down , how many left ? I wonder if theses "NFL Execs" are currently employed. Here are the facts. 2. The only QB in that draft that I would have drafted over him was Mayfield. 3. For me, Darnold is still very much TBD. I smell injury problem with him. 4. If the Giants were 9-7 or 10-6 this year (could have easily been with some defensive stops), would we still be having this discussion. 5. Barkley has been anointed a "Generational" back by real NFL execs, HOF players, etc. This topic is really old. I would ask those NFL execs, that outside of Mayfield and knowing what you know now about each players body of work, who would you pick. I don't believe many thought that Darnold was a cant miss franchise QB, which he still has to prove in my opinion. Barkley did that already. This is so wrong, on so many levels. You smell an injury problem on darnold ? Based on what. Lol @ the idea the giants could have been 10-6, they also very easily could have won 2 or 3 games. that can't possibly be proven yet. Your leaving out the fact that you have to a build a team, Eli is old and not good, and positional value. You do not just draft best player available . Gurley was 4th in rushing attempts, 3rd in rushing yards, 1st in rushing touchdowns, 2nd in rushing 1st downs all of this while missing 2 games. I find it hard to believe no matter what the rams or Gurley said that he was 100% healthy. Just stop with this ludicrous generational term, what does that even mean ? Is Barkley going to end being better than Levon Bell? drafted in the 2nd round? Just for example, and what happened with Bell? He sat out the Steelers replaced him with Conner and were just fine at the position . Is Barkley going to be as good as Barry Sanders- highly unlikely, what did Barry Sanders ever win without a QB? not a damm thing. Isn't that the point? They took work away from Gurley in the biggest games and gave it to a guy who was cut by 3 different teams this year. Do you really think Gurley's touches aren't going to be reduced next year? His 4th year in the league and he already has to have his role reduced. Just stop with this ludicrous generational term, what does that even mean ? It probably means the Giants are going to lead the league in tv commercials and social media posts between Barkley and Beckham. If Engram dyes his hair blue and starts dating a Kardashian, the homers will have everything they want. And there's no guarantee Eli will want to call it quits by 2020. He wants to be the starting QB until he's ready to leave on his own terms and since the Giants wont have someone ready to take over until at least 2022, Eli will be leading them until then....and Barkley and OBJ will have that much more wear & tear on them. At this point Eli is like an anchor tied around the Giants neck, but since they don't want to part with him they'll sink to the bottom. Eli Manning is only under contract for the 2019 season. He will be 39 years old and an UFA in 2020. I know that. But if the Giants draft a QB between 2019-2020 that person won't be ready to take over until at least 2020-2022. Which means the Giants will need someone knowledgeable with the offense, which means they'll probably just extend Eli 2 more years until they deem the young QB ready enough to take over. Which will be music to Eli's ears because it means he'll remain the starter for a few more years. I do not want the topic to go away, because it is an important 1. I just don't like every thread turning into that topic. As is, the stadium has sections which are completely void of fans who bought tickets and stayed home. If the underlined becomes reality there won't be any season ticket holders left. 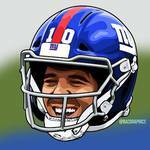 The idea of Eli playing QB on this team in 2021 or 2022 is downright frightening . the cool stuff, not dull stuff like winning . lets see how this shapes out. That is a ridiculous statement . would have taken Barkley over Darnold. and the RB he picked by definition has a short shelf life- one year down .